Since Babylonian times, the constellation of Gemini has represented twins. 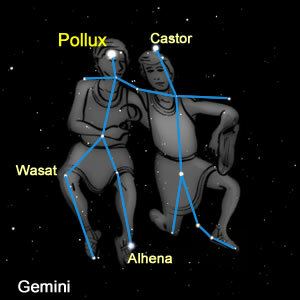 The Greeks named the twin brothers Castor and Pollux. The story begins, as usual, with Zeus disguising himself so that he could seduce a beautiful woman. This time his disguise was that of a swan and his chosen lady was the beautiful Leda on the night before her wedding to Tyndareus, the king of Sparta. 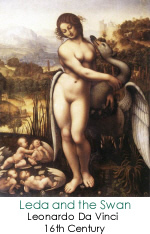 Leda gave birth to two eggs, one of which contained Pollux, who was Zeus' son and therefore immortal, and his sister, Helen of Troy. The other egg contained Castor and his sister Clytemnestra, fathered by Tyndareus. The twins were raised by the centaur Chiron who taught them in the martial arts. 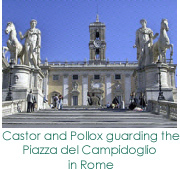 Castor became famous as a horseman and great wrestler while Pollux grew equally skilled at boxing. They were inseparable companions who had many adventures, one of which was to rescue their sister, Helen of Troy, from the Athenian hero, Theseus. Another of those adventures was to sail with Jason and the Argonauts in search of the Golden Fleece. While on that great adventure, they saved the ship Argus during a storm. They came to be known as St Elmo's Fire, patron saint of all seafarers. It was said that they had power to calm the winds and waves. Even today, when sailors see the twin balls of blue flame that light up the mast during a storm, they can rest assured that the storm will soon be over. But the story of how the stars of Gemini got into the sky relates to a further adventure. Castor and Pollux had some cousins, Idas and Lynceus, who came along on the trip after the Golden Fleece. There had been some bad blood over wife stealing in the past, but that was all reconciled during the trip. A few years later, the cousins decided to go on a cattle raid together. It turns out that the cousins cheated the twins out of their fair share of the stolen cattle. A fight broke out and Idas killed Castor. Castor, as a mortal, was destined for Hades, far below ground. Pollux, who was immortal, begged to share his immortality so that he would not be separated from his brother. His wish was granted by Zeus, who placed them together in the sky as the constellation, Gemini. So what can we learn about the Gemini energy from the myth? One thing that stands out is the need for brotherly love. This is an asexual type of love for which we are willing to give up our own life. When planets traverse Gemini, brothers and sisters play a more active and important role in our lives. Another standout is the need for diversity. Gemini is Mutable, which means adaptable. Variety is the spice of life for Gemini. Being able to thrive in many different environments is a key theme of the Gemini energy. Gemini is also an Air sign, which brings in the mental nature. Is ruling planet is Mercury, messenger of the Gods. There are no walls that can contain air. The thought process occurs at the speed of light, maybe even faster. Learning is easy. Put them all together and you get one of the dominant characteristics of Gemini: talkativeness. Words are of paramount importance when you're talking about Gemini. But these are not the deep, pondering meanings found in some of the other signs. These are words for the enjoyment of words. It's the capacity to understand many, many things. And the desire to communicate them to others. When planets transit Gemini, we all become talking machines. Too much of this energy means nobody is listening to what anybody else has to say. Dating from ancient times, many cultures have seen two humans in this star pattern that looks like two stick figures. Gemini is the Latin word forTwins. The heads of the twin figures are the bright stars Pollux and the somewhat fainter Castor, two of the brightest stars in the night sky. Pollux is one of the few giant stars with an orbiting planet. Castor is actually made up of six stars, two of which can be discerned with a telescope. In the Egyptian cultural center of Alexandria lived Ptolemy, one of the most influential astronomers of the 2nd century AD. He wrote a book called the Almagest, which included a list of 48 of our present day constellations. To Gemini, he assigned 18 stars. Gemini is the northernmost of the constellations in the zodiac. It lies above and to the left of Orion and is best seen during winter and spring.